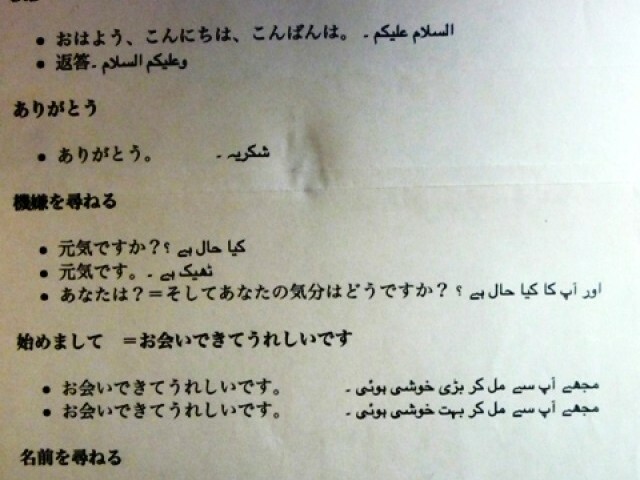 My instructor handed me this paper which had Japanese translated in to Urdu - In Pakistan, we would have been given translations in English. In front of me was the land I was dreaming of – my new home for five months. The aerial view of Tokyo gave me butterflies in my stomach. I was there to study at the very prestigious Waseda University, but studies were the last thing on my mind. I thought there was much more to the trip than academics and I was proven correct as soon as I landed and was received by a group of university students. We tried to communicate. I didn’t know Japanese and they didn’t know English (Urdu, was conveniently out of question). They told me I was the first Pakistani they were meeting. That’s when I realized that their perception of me will be the impression they form of Pakistanis in general. I felt burdened with responsibility. I represented Pakistan. It only took me the journey from the airport to my dormitory to form my first opinion of the Japanese. They are extremely helpful and kind. Even if they are running late and you stop them to ask directions they will make sure that you can reach your destination. I could not speak or write Japanese when I arrived and felt handicapped. I could not read anything – street signs, restaurant menus or shop names. Even the English words were written in Katakana, a script Japanese use to write foreign words. I realized that to live in Japan, I would have to polish my Japanese speaking and reading skills. I also felt that my home university should have the Japanese language as an elective so that students could learn Japanese before coming to Japan in future. Back home, I always propagated the use of our own language (be it Urdu, or one of the provincial or regional languages) but a few days in Tokyo made me a total pro on the subject. Here is the link for the Japanese lessons: http://www.nhk.or.jp/lesson/urdu/index.html. If you have a Mac, an iPod or aniTouch, they are also available as podcasts from the iTunes store. The website was in Urdu. She was clearly oblivious of the fact that as far as we have sites in English, we don’t need Urdu ones. On another day I was extremely touched when in one of my Japanese classes, my instructor gave me a printed paper. It had text in Japanese and Urdu, as seen in the picture. I again wondered if he knew that when we are taught languages in Pakistan, most of the times, its taught in English. Never would I expect a language instructor in Pakistan to hand me anything like the paper he gave me. Lets compare this scenario with what language/communication difficulties an exchange student to Pakistan might face. None – as long as they know how to speak in English. ”Is there a need?” was the question I got in reply. And although I hate to admit, I had to agree with her. Who needs to learn how to read Urdu? Even the people at the lowest level of the social hierarchy say ‘thank you’ instead of ‘shukria‘, and use numerous English words in daily speech. They feel dominated if you converse in English with them. If asked to speak in Urdu without employing a single word from English, many students of some elite universities and schools will miserably fail. Even worse is the fact that they will ‘laugh it off’. For them, apparently, speaking in English is related to having a higher self esteem. How many times have people with fluent English not laughed at someone without the same proficiency level? How many times have we not seen a person constantly struggling to converse in English? How many of us have found ourselves talking to foreign visitors (British or American mainly) entirely in English instead of trying to teach them Urdu? These behaviours denote much more than what we think they do. They signify the ‘colonization of the mind’ – a concept many writers have talked about, in vain. The ‘colonization of the mind’ theory was once more proved true by a friend here in Tokyo. I was called an ‘English Pakistani’ once he saw the wall posts on Facebook by my Pakistani friends, all of which were of course in English. I hated to be called that. I was deeply ashamed that I, a Pakistani patriot, was not recognized for her true identity but had become accustomed to living in a borrowed one – English. Why are we English Pakistanis? I want to be a Pakistani. Just a Pakistani. We may know English, as the British may know French, but that shouldn’t make us English Pakistanis just as it doesn’t make the British French British. I wouldn’t say that Urdu medium education is a tool to keep poor people disenfranchised under the garb of culture and identity, but yes, the net effect is the same, despite there not being any intent to achieve this effect. Pakistan is heterogeneous country,there are many ethnic groups here and many languages are spoken here,Urdu is only the first language of 4-12% of the population. Japan on the other hand is a homogeneous nation,they only have one ethnic group,and speak only one language,also Japan was never a British colony or a colony of another country,that’s why they managed to retain their language. Pakistan is a Mosaic of Cultures much like Canada,where people retain their traditions,and English is increasingly being used as the ‘Lingua Franca’ here. We should embrace our Anglo influence,and accept English as the National language. Pakistan can be as powerful as the United States if we accept the fact that we are an ethnically diverse country. Well… I like your idea. do have a look at my Urdu blog. We have hundreds of Pakistanis blogging in English … I do not know whom they are talking to … because most of Pakistanis cannot understand them. As someone else said English is the global language, so I see no reason to be ‘ashamed’ to speak it. Fluency in English = Better job prospects. I have been in Japan for the past four years, if you have problems communicating I can help you with some learning material which might help you go through these times. Happy to note that you are the first Pakistani the Japanese are meeting. So, to be a good ambassador of Pakistan, you should start doing moderate Tableeghi work among your classmates, along with the girl from Lucknow. I am sure she is Muslim too. You should also distribute books like ‘Science in Islam’, ‘Rights of women in Islam’, ‘Miracles of Islam’, ‘Islam means Peace’ etc. Since most people have misconceptions about Islam, as a Pakistani, you have a duty to spread the beautiful message. English has become imperative in this global village; however, not a genuine need of Pakistani. Indians or Pakistanis Ghulamee keee bad tareen missaaal qaim kar rahay hein, and they will not prosper until or unless they excel in their native language(s). Quite optimistically written piece of articulation..
Now whats happening in Pakistan is quite dejecting, while we 1st of all are declearing a foreign language as our official Language, even our courts are understanding and speaking only English, which means if Any of common pakistani is needing Justice, he must have achived such status in Spoken English.. Our prestigious intitutes through our Armed forced to Parliaments are attentive enough toward supermacy of Alien Demi-Lords.. I like the views of the writer. The term ‘colonized mindset’ she used is aslo very much appropriate for us. Its not ‘Inferiority complex’ as suggested by a commentator named ‘bangladeshi’. yeah kinddaaa right. but this article was kind of related to attitudes in elite class and elite university like ours LUMS or Nust etc. In middle, lower middle class that doesn’t send or can’t afford to send their children to lgs, kgs or beaconhouse; urdu or other local languages is what they teach and communicate in. Its only when your economic class changes to elite or you are already in that circle, you start seeing and adopting this attitude. Basically speaking english or adopting the lifestyle and attitudes being discussed are considered as the dividing lines between elite and so called middle/lower class. I think its time we stop arguing about this language phenomenon … We needed Urdu because we have different ethnic and lingual groups and thus Urdu seemed a better choice so every one could speak and understand each other but the world has moved on .. We know live in a global village .. where one need a language on bigger level that is understood and spoken by majority of the population thus one should emphasize on learning English. Besides I don’t get your point of saying English Pakistani? Its same as mixing religion with government. Language is medium of communication not a sole source of identity. My mother tongue is Pashto that doesn’t make me Pashto Pakistani. BTW we can see the influence of Japan from your dp lol. Nothing wrong with being an English Pakistani, eh? Everybody is haveing so much to say, as its very controversial issue we are comming accross. As a civilizational factor language counts alot in each and every society arround the globe and possesses its own value regarding the socio-cultural aspects..
Ali Tanoli.. Dude, if being english-medium can secure you a job, the firangis must be having some hell of a time there, no? b) most Europeans learn in school atleast one other language besides their own..
Good article. I wholeheartedly agree to your analysis. Not only this, but if you happen to say Salam to someone, you oftentimes get the cold reply “hi” or “hello” which is offensive. I remember having some Russian delegates who came to my work place and as I said “hello” to the man, he replied “asalamoalikum”. This was really embarrassing and thought-provoking. Students could learn English and native language. One should keep in mind that major countries (US/UK) where English is spoken is spoken are on road to permanent decline. The reason is that both with be led by the minority populations who are in schools that are so bad, they cannot graduate high school let alone go further. This means their income potential is extremely limited.